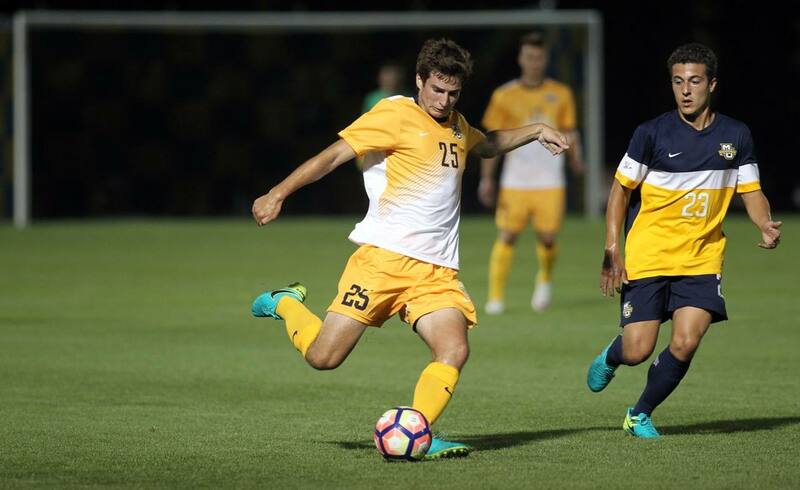 Milwaukee Panthers men’s soccer fans reminisce back to the 2000s when the five Dombrowski brothers – Chad, Scott, Tighe, Neil and Zeke – wore the black and gold and led the program to heights it had never seen before. Playing under iconic head coach Louis Bennett, the Dombrowski brothers developed into some of the program’s top players in recent memory. A Dombrowski hasn’t suited up for the Panthers since 2007, which feels like an eternity for soccer fans. But now nine years later, another Dombrowski brother is sprinting back and forth on a college pitch in the city of Milwaukee. However, it isn’t for the Panthers. Instead, it’s for their cross-town rival – the Marquette Golden Eagles. Freshman Cade Dombrowski is in his first season with the Golden Eagles and although he considered playing at UWM, he felt his best opportunity was playing under Bennett at Marquette. When Bennett began to recruit Dombrowski, it wasn’t because of his last name. While he said that was an added bonus because he knew his upbringing and makeup, Dombrowski’s skills and potential are what made Bennett eager to land the instate recruit. “Cade never played with his brothers on the same thing so there was a difference,” Bennett said. “I think that was the difference because he didn’t have that direct connect that would make them similar. A midfielder at Whitnall High School, Dombrowski led the Falcons to their best record in school history at 20-3 during his senior season in 2016. He recorded 17 goals and 31 assists, as he led his squad to a sectional runner-up finish. When going through the college recruiting process, Dombrowski leaned on his brothers for advice. In his first couple months at Marquette, Dombrowski is adjusting to college life as a student-athlete. He’s enjoying the experience so far, even though he hasn’t played in a game for the Golden Eagles yet. Redshirting this season is a possibility for Dombrowski. In the meantime, Bennett would like to see Dombrowski continue to improve in the little nuances of the game, he said. “I think one of the key factors is that we have to find one or two positions that Cade plays,” Bennett said. “He’s managed to play nearly every position in his career. I think it is the time for him to become a specialist. I think he is very open to that. Dombrowski feels there are benefits to redshirting, especially having a year to adjust to the speed of the college game before seeing game action. But one thing is for sure, whether it’s this season or next, Dombrowski is ready whenever his named is called and is hoping he can make an impact for Marquette for the years to come.